Mahalla is a living block in the Muslim world where residents exercise self-governance. The latest decree the Uzbek head of state directs the society toward “improving the place and role of self-governance by citizens in society, turn them into local bodies engaged in providing realistic assistance and cooperation to the people.” the decree also provides for renovating mahalla committee buildings and paying pension benefits to the committee leaderships in full and in a timely manner. The national council for coordinating mahallas is now granted the status of a legal entity in the form of an association of citizens assemblies. Prime Minister of Uzbekistan is appointed the head of the national council. His first deputy’s rank is elevated to the status of a minister, who will be in charge of household matters, medical and transpiration services; the chairman’s deputy’s rank is elevated to the status of a deputy minister. But what is a mahalla and why does it need further improvement? We requested our local correspondents to seek answers to this question; we also interviewed experts on culture, political scientists and ethnologists. “The modern mahalla, i.e. an assembly of citizens, has essentially turned into a body that is simultaneously subordinate to several state bodies: the local city halls, the ministry of internal affairs as well as the National Security Service (locally known by its Russian title abbreviation, SNB). The chairperson of the mahalla committee spends a lot of time at various meetings, including those at government agencies,” says our correspondent in Andijan Region, who is well aware of the mahalla activities. The mahalla committees are tasked with insurmountable “workloads.” For instance, collecting debts on utility bills, collecting scrap metals and paper for recycling. They are obligated with subscribing to various print media, they are forced to collect donations from the population toward the development of children’s sports and other charity events. “The mahalla committees must participate in activities aimed at public services improvement: they are to renovate several hospital rooms before the president visits them, for instance,” our source says. In worrisome days of terrorist activity, the mahalla committees arrange for nighttime vigilance groups in their respective living blocks. They do so by installing special booths, maintain a logbook of cars and residents that do not live in but visit that particular block at nighttime. “Numerous commissions spring up immediately after the election of the mahalla committee chairperson, and the population has no idea about them. People mostly know about those employees who are in charge of assigning government-issued welfare. By the way, conditions for qualifying for those welfares are becoming more difficult year by year,” the Fergana correspondent continues. The election of a new president in December 2016 led to the imposition of new tasks on mahalla committees by local government bodies: they are tasked with preventing the submission of citizens’ complaints to the virtual receptions of the president and the unified portal for government services. “This is resulting in a noticeable activation of those employees who are responsible for meeting the population’s needs,” our source concludes. The experts Fergana interviewed are almost unanimous in their conclusion: the government needs the institution of mahalla as a tool for controlling the society. 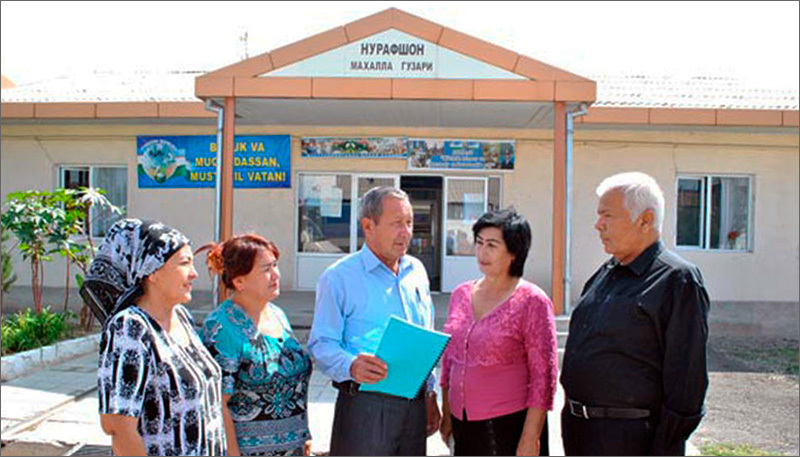 Maryam Ibragimova, a former professor of political science in a Tashkent university (political science has been completely removed from curricula in Uzbekistan), believes the mahalla assemblies are not fulfilling their tasks due to the population’s passiveness. “Our people are a very passive subject of politics. Human rights, as is known, are taken, not given. If our people do come one day to the realisation of their rights to influence the authorities and demand respect for their rights, then the mahalla committees and assemblies could become self-governance bodies. But that is the very problem—at this time, mahalla committees are not genuinely elected but are unofficially appointed by respective city halls. It is therefore natural that they are do not uphold our interests, but the interests of authorities. Usually a ‘trustworthy’ person is appointed chairperson. That position is an unpaid one, and brings nothing but troubles. The mahalla committees resolve various minor domestic issues, divorces, provide letters and, of course, report on ‘untrustworthy’ ones [presumably: to law-enforcement bodies]. They do not protect our interests in anything, at all. Not even in such ‘minor’ issues as regular illegal cut-offs of electricity and water, roads in terrible conditions, etc.,” Professor Ibragimova says. The mahalla in its current form, i.e. in modern sovereign Uzbekistan, is significantly different from the traditional concept and institution of mahalla that existed in history. “The perception of mahalla as a synthetic community built on the principles of goodly neighbourhood, friendship and often supported by familial ties—all this is just a part of a much more complex picture. The traditional mahalla is a system of popular self-governance, i.e. a form of grassroots democracy in which there is delegation of power, authority and even tools onto elders, who unofficially agree to act based on consensus. Now, the modern form of mahalla is the same distribution of money, authority and other aspects of governance from top to bottom, strengthening authority that is, but not necessarily that of the official government. I would not exaggerate the role of the mahalla as a tool for stern government control over the society. I would say this is more of a compromise-based, hybrid organisational structure in which the post-Soviet administration institutionalises the traditional forms of self-governance and even morphs into it,” cultural expert Aleksey Ulko argues.